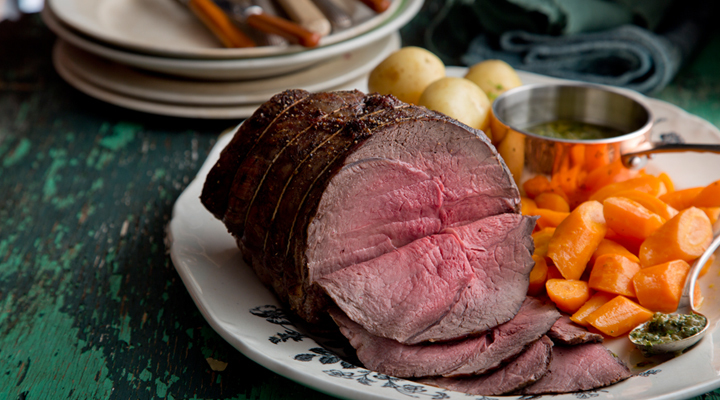 You don't have to be stuck in the kitchen all day to still be able to enjoy a fantastic Sunday lunch - this roast beef dinner can be ready in less than 90 minutes from start to finish. The salsa verde is a punchy sauce that goes just as well with the chicken or fish as it does with beef, making it a great recipe to add to your repertoire. In fact, you might even want to make a double batch. If you're serving the sauce to anyone who doesn't like anchovies, though, you could leave them out and the sauce would still be fresh and delicious, though it would lack that umami quality. Place the beef in a roasting tin and rub all over with the olive oil, then season generously with salt and pepper. Place in the oven and roast at a high heat for 30 minutes, then reduce the temperature to 150oC/gas mark 2 and cook for a further 10 minutes per 500g, so a 1.1kg joint will need to cook for 25 minutes more for beautifully pink, juicy, medium beef, until a thermometer inserted into the centre of the roast reads 55oC. If you like your beef more well done, cook for another 10 to 15 minutes, until a thermometer reads 75oC. Remove from the oven and cover loosely with tin foil for at least 20 minutes to allow the beef to rest and the juices to redistribute. Meanwhile, to make the salsa verde, place all the ingredients in a bowl and mix until well combined. You could also crush everything together with a pestle and mortar. Taste and season with salt and pepper as needed, but keep in mind that the anchovies and the capers are already quite salty. Set aside. When the beef comes out of the oven, place the potatoes in a large pot, cover with cold water and a pinch of salt and bring to the boil. Reduce the heat and simmer for 10 to 20 minutes, depending on how big the potatoes are, until cooked through. Drain well, then return to the pot with half of the butter and season with salt and pepper. Place the carrots in a large frying pan and pour in enough cold water to cover them. Bring to the boil, then continue to simmer on a high heat until half of the water has evaporated. Add the rest of the butter and some salt and pepper and keep cooking until all the water is gone and the carrots are cooked through and glazed with the butter. Keep an eye on them towards the end to make sure they don't burn. Carve the beef into thin slices and place on a platter, then drizzle over the juices from the roasting tin. Serve with the baby potatoes and carrots on the side and pass around the bowl of salsa verde to let everyone help themselves.